So – last month I got some Panda 4.0 lovin’ – when my search traffic more than doubled half way through May. More traffic is always great of course, but it did mean a potential 200$ monthly WPEngine bill – so I switched hosting providers. I wrote about the experience here – with an eye towards the speed of my site before and after the migration. So let’s see how the numbers look for June. All in all, the best month on Baeldung – ever. The one interesting source here is Disqus – which, strangely enough, had a significant spike around the same time as Panda 4 rolled out. I don’t see how the 2 can be related, but here we are – Disqus is my number 8 referrer now. 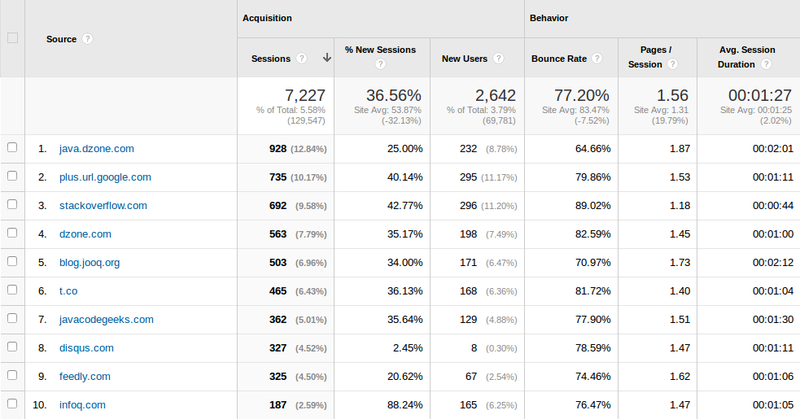 Unfortunately SEO traffic doesn’t have a great conversion rate for Baeldung – compared to the other traffic sources. That meant that even though I am seeing more than double the traffic – that traffic doesn’t equate to double the number of email subscribers. All in all – it was still my best month in terms of email subscribers: 736 new subscribers for the whole of June. So all in all – not to shabby – more than 50% increase compared to last month – so I’m not complaining. I am however running a few experiments that should allow me to convert more pass-by visitors to fans and email subscribers. Last month I started the building out my first independent video course (the Spring Security course with Packt wasn’t really independent). I’m moving forward with the recording, but at a much slower pace that I would like – which is not unexpected. I have also reorganized my entire autoresponder series (which is why I had to create another list in Aweber) – basically separating everything into courses and using a more logical cadence overall. Finally – I have continued to commission hand lettering illustrations for Baeldung (you can see these on the G+ page). Among several A/B tests and experiments I’m running on Baeldung – I’m getting these illustrations done for an entirely different reason – they just look cool.